According to the Hamilton Spectator, New Democratic Party Leader, Jack Layton, is not ruling out a coalition government with the Stéphane Dion's Liberal Party of Canada. NDP Leader Jack Layton is refusing to rule out a coalition government with Stéphane Dion's Liberals if that's what it takes to oust Prime Minister Stephen Harper. Whenever I hear people talk about the possibility of a coalition government in Canada, I usually have to remind them that coalition governments are so rare they shouldn't even be considered a reasonable alternative to a minority or majority government. However, in this case, Layton should know that the likelihood of a formal Liberal/NDP coalition in the House of Commons (with members of both parties sitting in the cabinet) is close to nil. To get an idea of how rare - and implausible in this particular age - coalition governments are in Canada, make sure to read our in-depth feature, Coalition Governments in Canada. I wonder if this is just a case of the media using the right term. I wonder if the question is really whether Layton would support and keep in office a Liberal minority. I find the media often uses its terms loosely. Layton did not technically use the word, "Coalition"
Asked on CTV's Canada AM if he would "entertain even the notion of entering into a coalition with the Liberals in order to get the Conservatives out of power," the New Democrat stressed he's never allowed partisanship to trump the greater public good. "I think what I'll do is hopefully sit down in the Prime Minister's office and pull together the leadership of my party and say: 'how can we best serve the country? How can we best get that childcare program we committed to? How can we best get those doctors and nurses trained and deal with these wait times?'" So reading this, I think Layton knows that a formal coalition government isn't possible, but he's open to working with the Liberal government to enact NDP "friendly" policies. Which is - if you ask me - kind of obvious. If the Liberals were to win a minority, and the Conservatives stood firm as the Official Opposition (opposing all Liberal legislation), Layton would not need to sit down with Dion... Dion would be banging on Layton's door, as the Liberals would likely need Layton to support their government. I am a conservative, (more of a political junkie at heart) but I have always secretly hoped for a coalition government to form. I don't care who is involved; I just think the politics involved would be extremely exciting. The only coalition government in our dominions history, the Union Government, formed in 1917 in an age where Party solidarity was a lot less important than it is today. MP's who ran as Liberals then joined the coalition government without Laurier's consent. This could not happen in todays Party system. Party's have much tighter control on their individual members and as such a Coalition government would have to be formed at the highest levels, between Stephan Dion and Jack Layton. Considering I have yet to hear Layton even acknowledge Dion's existence and the open fact that the NDP are trying desperately to pick at a weakened Liberal party, the chances for cooperation or even reconciliation after a hard fought campaign seem faint. 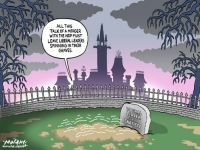 With Michael Ignatieff as Leader of the Liberal Party, is the Coalition Dead?